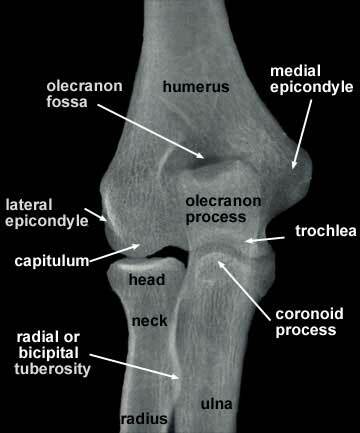 The lateral epicondyle of the humerus is a small, tuberculated eminence, curved a little forward, and giving attachment to the radial collateral ligament of the elbow joint, and to a tendon common to the origin of the supinator and some of the extensor muscles. Specifically, these extensor muscles include the anconeus muscle, the supinator, extensor carpi radialis brevis, extensor digitorum, extensor digiti minimi, and extensor carpi ulnaris. In birds, where the arm is somewhat rotated compared to other tetrapods, it is termed dorsal epicondyle of the humerus. In comparative anatomy, the term ectepicondyle is sometimes used. Plan of ossification of the humerus. 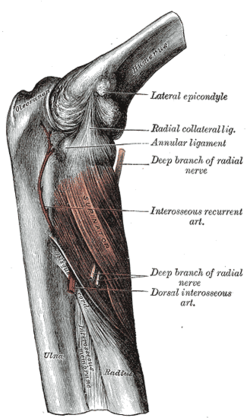 Posterior surface of the forearm. Superficial muscles. ^ Salidin, Kenneth (2011). Anatomy and Physiology: The Unity of Form and Function. McGraw-Hill. ISBN 9780073378251. ^ Shubin, N. H.; Daeschler, E. B.; Coates, M. I. (2004). "The Early Evolution of the Tetrapod Humerus". Science. 304 (5667): 90–93. doi:10.1126/science.1094295. PMID 15064415. ^ "Tennis Elbow (Lateral Epicondylitis)". OrthoInfo. American Academy of Orthpedic Surgeons. Retrieved 9 December 2013. This page was last edited on 27 November 2018, at 14:43 (UTC).